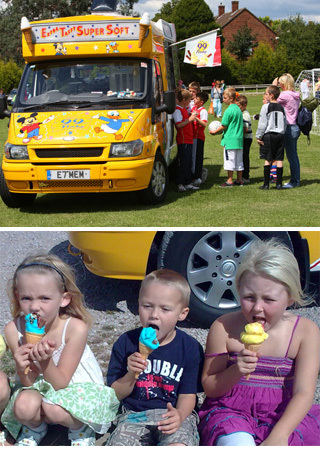 Ice cream van events hire for London, Kent South East! Ice cream van hire for your event! Extra Tasty ice cream is a well established family run business based on the borders of London and Kent. We cater for all types of large and small events throughout all of the South Eastern regions! Our aim is to sell quality products at a very competitive price whilst providing a great service for all our event organisers. We are very flexible and would be more than happy to modify our menu especially to suit your budget and individual requirments. Our ice cream vans (Photo's of our ice cream vans) will always be spotless clean on the inside as on the out side. Our staff are always uniformed, polite and attentive to all requests. We cater for all type of events including football tournaments & presentations, rugby festivals, boot fairs, fetes & fairs, corporate events, dog & horse shows, carnivals, festivals, classic car shows plus television & film work all catered for. Extra Tasty ice cream van hire have catered for many celebrations and parties including wedding parties, anniversaries, birthday parties, christenings, graduation events, proms and civil ceremonies. Extra Tasty ice cream cares about you! As a family run company, we know how much your special days mean to you and try our utmost to give the best service we can to present you a stress free day. We will adapt to the situation regardless of any changes which may arise on the day of the event because we believe in our customers' happiness. We are very passionate about what we do and how we conduct ourselves to our customers. We cater for all type of events covering London, Kent, Essex, Sussex, Hertfordshire, Middlesex, Buckinghamshire, Surrey and Hampshire.